FILE - Big-game trophies abound at an international hunting fair in Dortmund, Germany. Trophy hunting for big game is a controversial blood sport. Parts of an animal – such as the skin, horns or head – are kept as a trophy, with the carcass often used for food. In some African countries, it is a legal and lucrative business. A 10-day "elephant package" could cost $36,000 and hunting a rhino could set you back a hefty $100,000. South Africa’s luxury tourism industry allows the hunting of elephants, rhino and other wildlife. It is an emotionally charged issue. A 19-year-old college cheerleader from Texas provoked an uproar in July after posting pictures in which she posed with dead African wildlife she had legally hunted on a trip here. While many frown on the sport, some conservationists argue that trophy hunting generates crucial revenues needed for the conservation of Africa’s wildlife, including big game. Tourism and donations do not come close to covering the billions of dollars needed, says zoologist John Hanks, former head of the World Wildlife Fund’s South Africa chapter. Around 9,000 trophy hunters travel to South Africa annually – 90 percent of them from the United States. In 2012, foreign hunters spent $115 million in South Africa, where the hunting industry as a whole brings in more than $744 million annually and employs 70,000 people. It is the single most lucrative form of commercial land use. Herman Meyeridricks, president of the Professional Hunters Association of South Africa, contends legal hunting is crucial to protecting wildlife. Permits would not be awarded to hunters if the animals were genuinely threatened, Meyeridricks said, adding the number of those killed is “insignificant” to what is available. The London-based advocacy group Save the Rhino counts just over 5,000 black rhinos and more than 20,400 white rhinos in Africa. 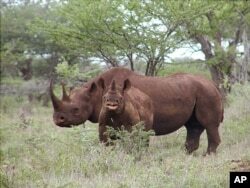 More than 80 percent of the continent’s rhinos are in South Africa, National Geographic reports. The nations of Namibia and South Africa can sell five permits a year to hunters of adult black male rhinos, according to Conservation magazine. FILE - In this photo from U.S. Fish and Wildlife Service, a black rhino male and calf graze in Mkuze, South Africa. The Convention on International Trade in Endangered Species, or CITES, controls the number of animals allowed to be killed legally. Critics say the oversight body is flawed, because it leaves monitoring quotas to individual governments. Susie Offord, Save the Rhino’s deputy director, maintains trophy hunting is a useful conservation tool if managed properly. Criminal networks, coined as pseudo-hunters, also have exploited trophy hunting to launder horns. They command high prices on the black market in countries such as Vietnam and Thailand. South African officials say there have been an estimated 300 instances of rhino horn exports by pseudo-hunters since 2009. Since then, the country has stopped issuing hunting permits to nationals from the Czech Republic and Vietnam. Conservationists such as Offord say governments need to do more to fight criminality and reinforce hunting regulations.